I agree that the helmet was first painted all black (both Brian Muir and Dave Prowse have said the helmet was originally all black) and then gunmetal added afterwards. That is what gives it the brushed look because the black occasionally comes through in the thinner areas. The front face of the mouth (teeth) and the front edge of the mouth triangle are clearly black. The inside sides of the mouth on left and right are, at least in my opinion based on the ILM photographs of the original mask, gunmetal. That being said, they were painted black on my own mask but that is because I hadn't even noticed it until I saw the mask in person. I'll get to the corbis/chronicles photos later in regard to that ring detail but I'm not saying it is just a paint detail (so I agree with Carsten). You can definitely see that the inside mouth wall has brush strokes in this picture. But to me it looks like the same lightly drybrushed look as on that same outside mouth wall and not similar to the more clearly "grey" areas. But I'll leave that up to interpretation. Great finished piece! Really ups the level of detail. I had a second look at the Corbis and the Chronicles. It might be there on the Corbis, at least the ring, but certainly that area has been painted over. And it is much harder to resolve if at all on the Chronicles. Sure it might be there under the new paint, but the fact is that it was painted over. I doubt you would see the kind of detail on the SL ANH matching the original mask before it was touched up or repainted prior to being molded. But there is a clear boundary between the black paint on the mouth's edge with the interior left side of the mouth. So what else could that boundary be? There has to be something other than black paint on the inside of the mouth then. And that something is gunmetal. Thomas, thanks. Amazing comp there! Have you tried swapping the domes? Last edited by CSMacLaren on Fri Mar 01, 2013 8:04 pm, edited 1 time in total. Yes, but with drybrushing... you can have different effects. You are just lightly highlighting something, but not really painting it over with a solid color. They brushed with gunmetal all over the mask - even the planes that are still considered "black". That's all I'm saying. When I'm finally going to paint my TM I will take a look at how much detail remains - depending on the thickness of the paint job, you CAN absolutely still get good surface details if you mold it. Especially when sprayed, you can get really thin paint layers, so I'm still not seeing anything that convinces me that it wasn't molded after the repaint. It looks like the teeth have some dry brushing as well. A fascinating work! Just great! The detailed analysis look like photos of Curiosity on Mars. In a way, they serve the same thing. Looking for authentic traces of a long past life! My respect for this exceptional practiced passion! yes you can. ive been trying to determine this from screen grabs. but its very hard to tell. until of course. i saw this image and the one Thomas posted of the original ANH helmet. not screen grabs. 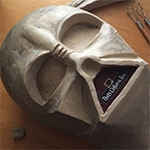 but images of the ANH helmet none the less with the inner sides of the mouth appearing to have gunmetal. you can see the inner sides of the mouth painted in the gunmetal. how much gunmetal is hard to determine. but in this image you posted you can clearly see the brush stocks. i think no humor man may be right as far as application of the gunmetal t the inner mouth walls. that would confirm the reason why it appears so dark. . as far as the inner mouth walls of the ANH lid being full on GM. 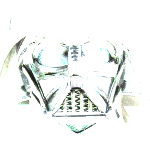 the original ANH helmet b&w image does appear to be GM too from what little there is to see of it. but i did find something very interesting. i understand this is an ANH helmet discussion. but i felt the need to share this whit everyone here in this thread concerning the inner mouth walls painted gunmetal. some may already know this. but this is for the ones who dont. but what i did find from an on film screen grab (not ANH) to prove the inner mouth walls were indeed painted gunmetal (and form what i can see in the image it appears to be full on GM). is this image of Vader when he storms the rebel base on Hoth with the snowtroopers. you can clearly see the inner wall is indeed GM. my observation is that from the photos that we do have and that have been shown here. ive come to the conclusion that more than likely the inner mouth walls along with both outer mouth walls were indeed painted in GM. and more than likely in different shades or amounts of layers that were applied. that would explain the different looks or appearances you see on film in an array of different lighting. and from what the original b&w image shows is that the right C scare cheek has a layer of GM over the black. unless of course someone reveals a screen grab that proves other wise. i could be totally wrong with my observations. I'd have to check the mouthwall on the shots of the Planet Hollywood ESB Bust and Lamboutour's photos of the ESB Stunt, but short of that it strikes me as gloss black paint reflecting the light that is illuminating the metallic gray right cheek. The efx looks like a toy compared to this finished SL one.